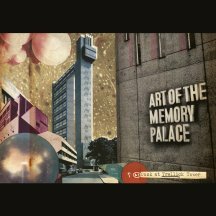 Four years after their critically acclaimed debut on Static Caravan Records, Manchester / Dundee based duo Art Of The Memory Palace announce their highly anticipated new EP, ‘Dusk at Trellick Tower’. With this new work, the duo accelerate their trajectory since 2015’s incendiary debut, ’This Life Is But A Passing Dream.’ Upon its release the latter was called “Fresh and euphoric…an incredible debut” by The Quietus and “Fantastically addictive” by The Sunday Herald, while Shindig! Magazine proclaimed, “A spine-chillingly satisfying journey into kraut-influenced electronica”. In the years since, AOTMP have released a split 7” with esteemed Welsh psych label Fruits de Mer Records, a long sold-out spoken-word collaboration with acclaimed Scottish author James Robertson, and a limited-edition cassette-only French Noir soundtrack album on Horror Pop Records. Radio support has come from Gideon Coe and Tom Ravenscroft on 6Music, Vic Galloway on BBC Scotland and Andy Weatherall on NTS. Raz Ullah (synths / tape loops) has become an intrinsic part of Jane Weaver’s touring band, while Andrew Mitchell (vocals / synths / guitar / bass / drums) has released two albums under his ‘Andrew Wasylyk’ moniker. ‘Dusk at Trellick Tower’ is inspired by Hungarian Brutalist architect Erno Goldfinger; a towering presence in Modernism who courted controversy throughout his life. Known for being a humourless man prone to vicious rages, as well as the inspiration for Ian Fleming’s most notorious Bond villain, Goldfinger. Across the six tracks, Ullah and Mitchell channel the darkness and dystopia which grew from much of Erno’s work, building synth-heavy sonic edifices evoking lonely night time walks along empty echoing corridors, urban decay and towering, impassive concrete monoliths. Using analogue synthesizers, drums, bass and tape loops processed through long chains of effects pedals, Art Of The Memory Palace strive for greater depths with this release, weaving menacing hooks and icy vocals together with droning chords and ambient soundscapes and creating their own shade of dark, beautiful melodies in the process. 250 edition 12” record on classic black vinyl with sleeve artwork by Andy Votel.